This week, despite the heat in Manchester, I’ve done quite a bit of gardening in the evenings, when most of our North facing garden is in the shade. I notice my mood is better if I’ve spent time outdoors, especially pottering around and watering the plants. I’ve rationalised my plants into bigger pots, pushed together so that I can water everything I need to and bigger pots retain the moisture. It’s also the first summer I’ve watered shrubs in the garden. It takes me about half an hour to water the pots (with a watering can and water from the water butts). We have had so little rain here – and the temperatures have been in the high 20s for a couple of months. Also, I’ve put succulents, sedums and drought tolerant plants in my hanging baskets. Gardening helps me be mindful – as does yoga. I’ve been practising yoga, on and off, for about 12 years, starting completely by accident. A friend of mine had a pal who was learning to be an Iyengar yoga teacher so needed people to practise with. It was right next to work, straight after work so it seemed a good thing to do. It changed my life. When I was younger I had poor spacial awareness and was always tripping over, which lead to some hilarious incidents including my Steve (my former partner) pulling me out of a peat bog as I’d sunk up to my knees and was slowly falling face forward into the bog. Another time I went flying, just as a busload of tourists came round the corner in very rural Ireland. I was always collecting bruises from bumping into things. It’s a long time ago, but the first things I noticed doing yoga was that it helped me stretch (especially my hamstrings), helped calm my brain as I was concentrating on breathing and the position of my limbs. I learnt to do corpse pose (Shavasana) not ‘banana’ pose as my first Yoga teacher Jacky named it. Yoga isn’t a quick fix – it took me about 6 weeks to see the real benefit. I carried on with Jacky’s classes and then John Aplin for years until my work pattern changed. This entry was posted in Health and Wellbeing, In a vase on Monday and tagged blurtfoundation, blurtselfcareathon, daily journal, dianthus, Gardening, In a vase on Monday, lavender, micro actions, sweetpea, yoga on August 7, 2018 by Bec - views from my garden bench. Madame De Stael (1766-1817), a woman of letters, at the heart of European romanticism and a leading opponent of Napoleon. This year has been very tough, I’m not ready to go into details at the moment, but I’m beyond fortunate to have my family and friends around the world, supporting us all – but most of all My Chap whose been my rock since the day we met. Im SO excited to be marrying him later this year. My health hasn’t been great, including much increased arthritis pain too, contributing to bad sleeping and chronic exhaustion; but I’m working on all sorts of strategies to help me. I am grateful to everyone who supports me, the NHS staff, colleagues, friends and family – I’d be in a pickle without them. Amongst these tough times, there has been times of happiness, things and people that have made me happy. As part of my mindfulness practise, I’ve been noting them down, more systematically, in my diary. I love my Stigu Planner*** (http://sticktostigu.com/); it’s a combination of a diary, note book and to do lists. They describe it as a rest and zest handbook – there are themes for each month, weekly practise activities – some of them are really funny cartoons. 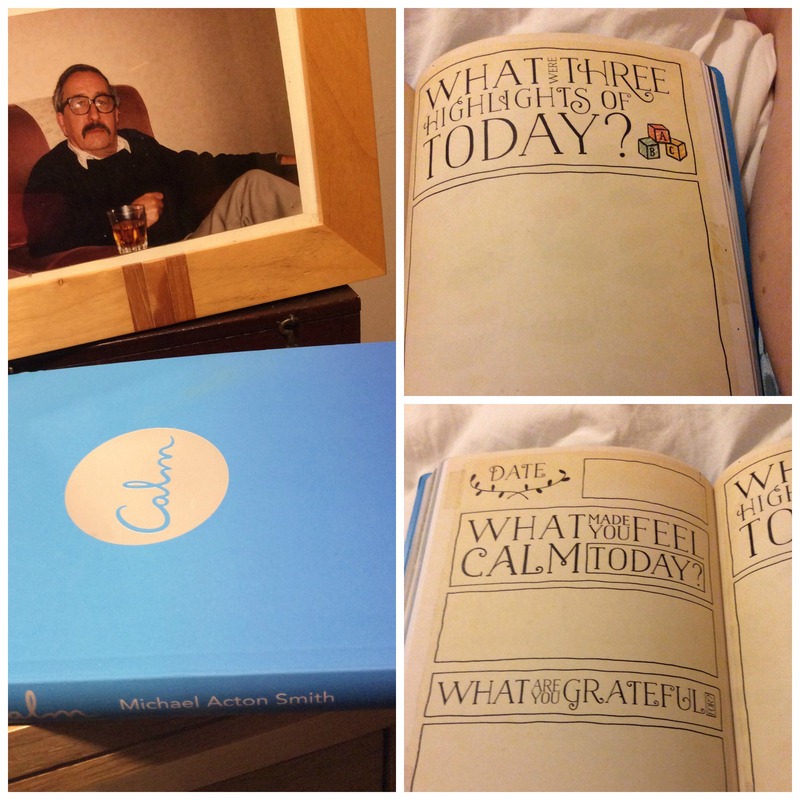 I had a stigu journal last year too – it’s not too ‘full on’, supporting my wellbeing, without being all about ‘rules’. What were three highlights of today? It’s so beautiful with wonderful illustrations and pictures; I can’t write in the book – I tend to write in my stigu journal instead. For well over a year, I’ve been making a note of my arthritis and pain symptoms, as participant in Cloudy with a Chance of Pain, (www.cloudywithachanceofpain.com); it’s a citizen science project run by the University of Manchester investigating if there’s a connection between weather conditions and chronic pain. For me, warm, dry weather definitely helps my arthritis pain; I’ve been tracking it with an app as part of the project. I’m looking forward to reading the wider results. 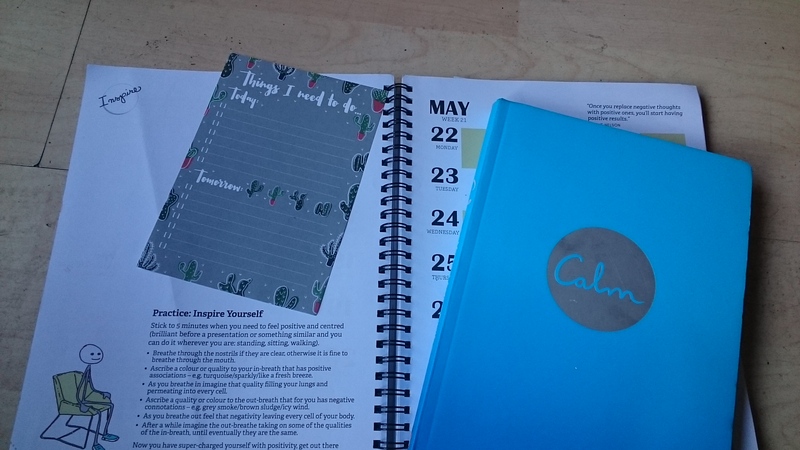 Also, I’ve been doing daily mindfulness practise for a couple of years now, and reflecting on what I’m grateful for each day – so I’ve decided to be a bit more organised about writing them down, so I can look back in the future, as my situation improves. I’m grateful for all these things these things, and yoga too. 7 May 2017 – been replanting sedums for My Chap – mud under the fingers as usual. I managed to get out in the garden every day this week, sometimes it was for only half an hour to water the plants. It’s been v windy and dry here. We’ve managed to sort out, cut back and clear alot of the ‘dead wood’ from the winter. We’ve planted some shrubs too. Ive written before how my garden is my solace; I know I ‘need’ to spend as much time as I can outside – even if it’s just drinking tea in the garden – when I’m too exhausted to do anything more. I’ve been planning which flowers to cut for next week’s In a Vase on Monday too. A summary of my ‘In a Vase on Monday’ offerings since 2015. Cathy hosts the meme over at Rambling in the Garden – here’s her summary. Each post will have links to people (and their vases) contributing from all around the world. It was a bank holiday weekend here in the UK , and, the weather was lovely, so we had lunch in the garden everyday. My Chap is a great cook, and makes a great salad – this one had lovely heritage tomatoes too. My Chap and I talked about what what veg we might grow in the garden this year; cherry tomatoes haven’t grown well these last few years, we don’t have a greenhouse, so I don’t think this helps. The smoked salmon reminded me of all the men in my life who’ve loved it. My Uncle Fred introduced me to it when I was about 18 months old. He, my Aunt, and my Dad grew up in Hackney in East London before, and during, Second World War with many Jewish neighbours so it was a staple food for them. My love of cooking comes from them, I feel their influence and love every day, even though they’ve all passed on a good few years ago. The quote from Madam De Stael, was in my Stigu Journal, reading about her reminded me, we must persist. As Stigu notes elsewhere , life moves in spirals, only you can decide in which direction. I’m moving in the right direction… Slowly but getting there. ***Please note: I paid full price for both journals and afternoon tea, I wasn’t asked to write a positive review. This entry was posted in Gardening, Life and tagged #cloudywithachanceofpain, #stigu, afternoon tea, blogging, calm book, daily journal, Gardening, In a vase on Monday, monton, planning, smoked salmon, Wellbeing on May 8, 2017 by Bec - views from my garden bench. This entry was posted in 100 happy days project and tagged #100happydays, dad, daily journal on December 16, 2015 by Bec - views from my garden bench.